The Father Christmases are encouraged to practise bellowing over and over the greeting: "Ho, ho, ho!" 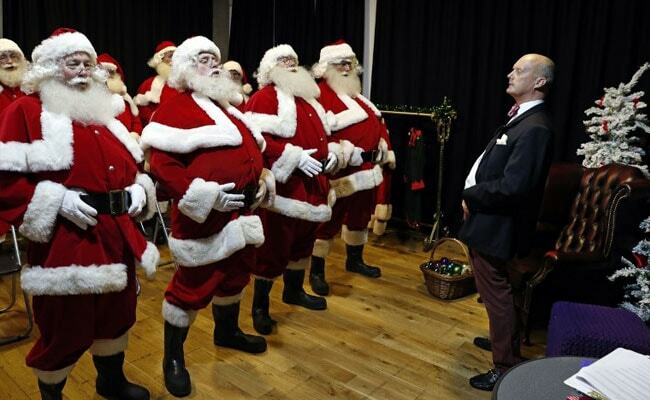 and prepare thoroughly for the dreaded question: "Are you the real Father Christmas?" 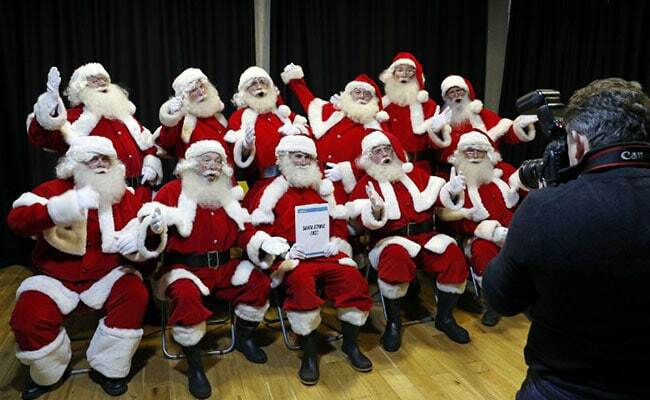 London, United Kingdom: Pens at the ready, a dozen trainee Father Christmases are getting their final instructions before heading out to Britain's department stores, tourist landmarks and private parties for the festive season. Dressed head to toe in the traditional red velvet costumes, bushy white beards and black boots, the would-be Santas take notes and engage in role plays in an anonymous south London office building. 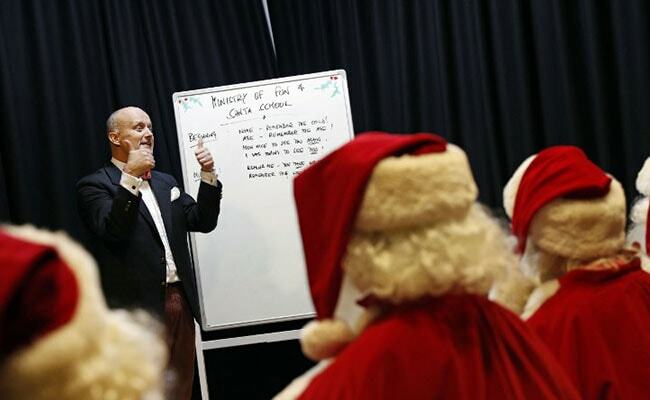 Their teacher, James Lowell, who runs an events company called Ministry of Fun, said being a good Santa is about training, not improvisation. "It is a big deal. Children are coming to meet him because he is a special person," he said. The encounter has to be "magical", said Lowell, who warns children cannot be left disappointed after hours of waiting to speak to Father Christmas. The slovenly appearance of some Santas -- wearing trainers or smoking -- is also a source of irritation for the 52-year-old, a some-time Father Christmas. The first step is getting the costume right. Lowell said the materials have to be high quality. A proper costume can cost around 1,000 pounds or $1,300 and a hand-made beard about the same. Good Father Christmases also have to be able to move with an ambling gait and are encouraged to practise bellowing over and over the greeting: "Ho, ho, ho!" Being multilingual is a plus and trainees have to be able to name Father Christmas's nine reindeers. There are some golden rules to remember, like never asking a child his or her name, whether they have written a letter or what presents they have asked for. Because "you know: you are magical, you are Santa", Lowell said. The final instructions -- never make promises so as not to put parents on the spot and create disappointment and prepare thoroughly for the dreaded question: "Are you the real Father Christmas?" Modern-day Father Christmas are also encouraged to do some swotting up at home to keep up to date with the latest toys, video games and consoles. "We have to do research to know what is on the shelves," said Santa David, who has been Father Christmas for 26 years. 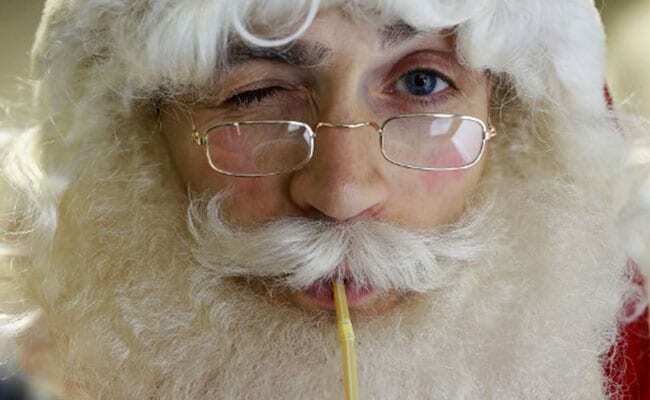 Like the other Santas, Santa David said he wanted to remain anonymous to preserve an air of mystery. Santa Dan, an actor who is celebrating his 14th year as Father Christmas, said: "I don't think there is something more joyful than seeing the reaction, the absolute joy on their face." On average, Father Christmases only have three minutes to wow children, given the long queues. Despite the weight of the costume, the heat and the noise in department stores, Santa Dan said the real skill is to "maintain that energy that it is just as special for the first child as the last." Santa Dan said Father Christmas has proved enduring due to his "generosity" and "kindness". Lowell said: "He's become a kind of symbolic figure, but not in a religious way. He is the figure that binds it together for everybody. "It does no harm at all... Children believe in him because adults want to believe in him too."